One landmark that anyone in the Rochford area must have noticed is the old hospital boiler house chimney, it can be seen for miles around. From Hawkwell to Stambridge and Canewdon to Southend the white chimney above a rectangular block dominates the surrounding houses. But the chimney is just the top of a very interesting building. When the old Rochford Hospital was threatened with closure this structure was one of those on the site which was listed as being of particular interest from the point of view of architectural history. The chimney was surrounded by a tall thin water tower which was the central part of a large rectangular building constructed in the Early Modern style. It housed all the boilers, fuel stores, engines, pumps, workshops and other equipment needed to supply hot water and heating to what, by that time, was a very large hospital complex which had been steadily expanding from the old Rochford Union Workhouse buildings all through the 20th century. 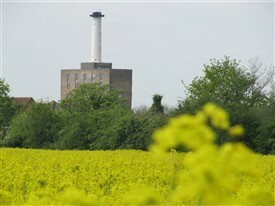 The boiler house design was in the style of both Bankside and Battersea power stations, though smaller and in yellow brick. The original contract was won by Tileman & Co., 22 Carlisle Place, Westminster, SW1, as shown on a document signed on 23 July 1938. They agreed to carry out the work at a cost of £1872. The initial brickwork was estimated to take just over three months but in fact the boiler house was not completed until the mid 1940s due to the 2nd World War. Fifty years later the hospital was closed and the boiler house became derelict - inhabited by pigeons and containing only rusting equipment. Until Squarefoot Properties Ltd. came on the scene in 1996. 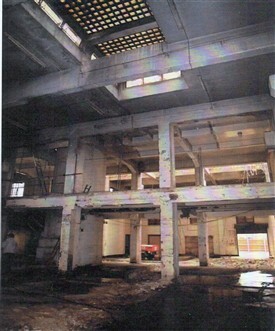 A company which specialised in turning disused industrial buildings into homes, Squarefoot could see the unique potential of the old boiler house, which could not be demolished due to its listed status but was becoming an eyesore. With architects Traer Clark and the support of Rochford District Council and English Heritage the entire building was converted into 31 spacious loft appartments. These homes still contain some of the exposed brickwork, original metallic equipment and other features of the hospital boiler house. The chimney is now a lift shaft leading to the higher level lofts and the positions of other installations for its original functions are highlighted as part of the design. This gallery was added by Sue Horncastle on 06/10/2012. In response to a query from Jennifer Jackson in 2012, see below. RDCA Admin. I knew Maureen Gaunt she lived in the nurses home at Southend General Hospital and was a theatre nurse. I believe she was a ship's nurse previous to working at SGH. Maureen became very ill and died c1973 on a ward in the tower block. She was a fun, lovely and considerate person. One day, I went to the ward to visit her, she asked me what I thought she looked like I didn't want to be unkind so I said she looked fine she smilingly ticked me off, saying she thought better of me. Maureen was looking for the honest truth from a friend! I was one of possibly thousands born in the hospital in 1945 when it was the maternity hospital for Southend-on-sea. "How high is the tower from ground level to the top most point, if anyone knows I would be very grateful kind regards - By Steve (02/09/2013)"
In answer to Steve I reckon about 38 metres give or take. The underneath of the top ring is 44 metres from the ground measured at a point 22 metres away from the base of the chimney, so a little calculation yields 38 metres for the vertical height. Measurements were taken using a laser rangefinder. When the building was converted it was necessary to stabilize the chimney with steel bands and I worked on the drawings for this part of the project. The boiler house as I remember back in the 1950s was coal fired before being converted to oil. It supplied power and hot water, including central heating not only to Rochford Hospital but to Connaught House, the "old folks home" which was next door. One of the chief electricians based there was Vic Bland who was often spotted riding his bike around Rochford in his blue boiler suit complete with pipe permanently lodged in his mouth. When i was a youngster, my Dad was a painter and decorator.I remember one time taking his sandwiches for his lunch when he was painting the metal work etc on the hospital chimney. I remember him swinging on a rope from the top - he was sat on a piece of wood that was fixed at the top.We lived at the end of Weir Pond Rd (the Stambridge Rd end)so we could see him from our house.